We all look for reasons to find an escape route and be in a zone where nothing matters except for that one thing which we love the most. For me travelling has always been my first love; travelling, exploring, skiing or just a mere drive to the unknown landscapes of my land. Kashmir is an unexplored country for me; it’s as diverse as the whole universe. I don’t just look at Kashmir through the muzzle of a gun; it’s also a country with a mystic nature beyond the concertina wire and bullets. As a kid they taught me in school how to love nature and learn how to be part of it. It’s this learning I carried forward unlike many others. For some people, life is about earning money and spending your entire life behind the desk. But for wanderers and explorers life begins at adventure and out there in the wild. The smell of pine, choir of wood, glaciers of blue ice, streams dancing through alleys of alpine peaks gives them the penultimate high which we call ‘nature high’. “I am high on nature” Sajid said with a grin and a laugh while pouring hot tea into a kettle. I looked around and found myself surrounded by tall pine trees with raindrops falling through sky covered with snow-capped peaks. I was high on nature too. “We encourage you to take the road less travelled. Do something extraordinary and step outside your comfort zone. 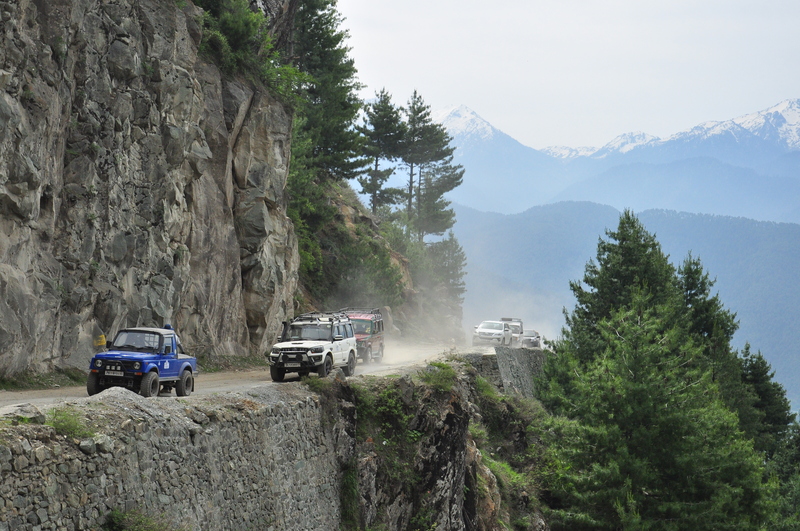 Feel the sheer joy of exploring the wild and beautiful”; says Ali Sajid who is an adrenaline junkie and the founder of Kashmir Off-Road; a club of locals from Kashmir leading the pack of eager adventurists to the less traveled roads. Luckily for me I found myself in their cavalcade starting from Hazratbal and became a part of their journey. We were a group of grown-ups figuring out what kind of stove to take along without knowing where the road led them to. Through serpentine roads starting from Manasbal Lake right till Bandipore, the road was expected to be an off-road route but it felt like somebody had land mined the whole road from Bandipore to Gurez. We reached Wullar and it’s no better than Srinagar’s Dal Lake; encroachment is at its highest; I think I saw rice fields inside the Asia’s largest fresh water lake. There is remarkable beauty around the lake but its ugly inside like someone has wrapped fancy pretty wrapper on a pile of garbage. An uphill journey from Bandipore to Razdan Pass leads us through deep forests of tall pine trees. The sight of a group of woman carrying wood on their heads reconfirmed for us that we are deep into the heart of rural Kashmir. Razdan Pass, which is located at 3300 miles above sea level, was still under snow. As a skier all I could see and fathom were the amazing piste slopes; untouched and steep. A saint had travelled from Lahore in 1933, they say; his shrine is now looked after by Indian Army. Call it some political statement? At the first checkpoint, an Indian trooper, with an AK-47 slung around his shoulder, bluntly demanded these particulars from us: “Drivers name, passengers name, car registration number and reason of visit?” Not aware of the dense militarization of landscape in and around Gurez, we naively thought this would be the only checkpoint. To our utter surprise there were a hundred more to follow. Now that’s what you are faced with when travelling to the most far-off parts of Kashmir valley; the land which has been fought for over a century now. Mount Harmukh is my favourite peak in Kashmir, not because of its difficulty to summit but because of its grandeur and beauty. You could see the grand mountain through pines, the sun shone on its peak and it looked more beautiful than pictures of it could ever reproduce. We commenced our journey downhill through rough roads and steep gorges, all of this didn’t matter as I witnessed a grove of Paper Trees, locally known as Burza. We find the same tree in Gulmarg but these were different, they looked a few centuries old. Trees are our ancestors and they have witnessed it all; the changing seasons or the travellers - from Franklin Roosevelt to Saddam Hussein. As we moved along, we witnessed glaring human intervention in nature that is Kishenganga Hydroelectric Power Project; which was started in 2007 and is still under-construction. The long-drawn project is said to have a damaging impact on the flora and fauna of Gurez Valley. The impact is quite visible in the spectre of ugliness that it has created in its wake. Our next stop was a small hamlet of Kunzalwan, where just across the hills lies the other part of Kashmir – beyond of what they call Line of Control (LOC). It didn’t feel that we were so close to the other side, somehow the life here seemed than the city at least. Kishenganga river, also known as Neelum flows 180 miles from Pakistan through Gurez and back to Pakistan. Such is the irony of nature. 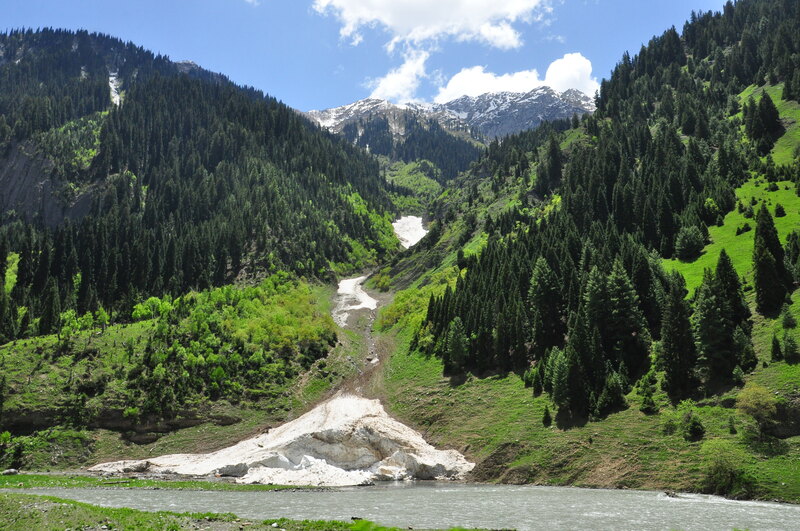 Neelum has bestowed Gurez with abundant water, adding quality to the picturesque peaks around. We reached Dawar, the main town of Gurez and only a few miles from us we could see rooftops indicating human life ahead. 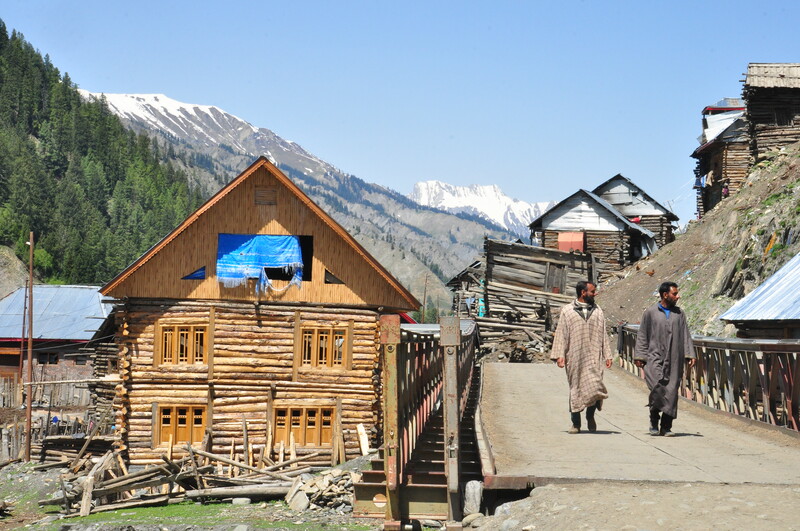 Sajid took an off-road track and settled on the banks of Neelum, a snow capped peak with terraces of rice fields at its foot. A huge green pasture - perfect place for lunch, overtook my hunger; I jumped off the gypsy and ran straight towards the stream. The breeze touched my face and I immediately knew that I had come home. A sudden smile on everyone’s face proved me right, the only thing that mattered was the moment. It was beautiful, I felt like I had been cradled in natures lap; all I could see was a vale surrounded by peaks. If you are a Kashmiri you do get to see that kind of vie often but this was different, the place is the mix bag of Gulmarg, Pahalgam, Sonmarg and Leh. I heard it was the epicentre of ancient Silk Route, there was something entirely mystical about this place. We finished our lunch on the banks of the roaring Neelum. An Indian army Major stopped by, he had information about us visiting; the conversation was mainly about Gurez and its isolation from the rest of the valley. The funny part was when he tried to explain us who Habba Khatoon was and how Yusuf Shah Chak was imprisoned by Akbar during the Mughal era. He was delighted by our visit, said he would want more people to come and explore this part of the valley – as if it was his own. At this moment, the occupation of Kashmir became stark to me. I felt occupied. Usually I would want to visit a place without any hassle or hiccups but when you have to seek permission from an outsider to visit a part your own country – it just doesn’t make any sense to me. I felt occupied and it disturbs to think how it happened. They say Taj Mahal is the symbol of love but I would disagree with that. When I laid my eyes on the pyramid shaped mountain I was awestruck by its grandeur and finesse, as if the angels had hand crafted it with utmost precision. 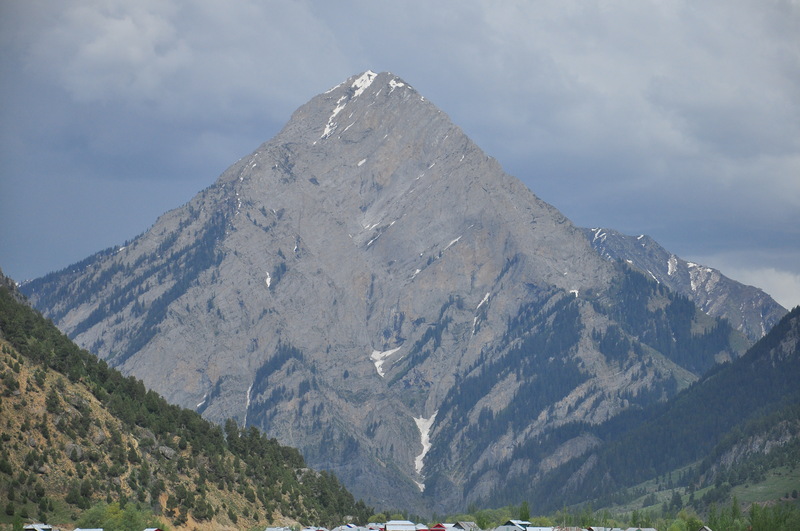 This is the mountain of Habba Khatoon, the legendary poetess of Kashmir. Habba Khatoon loved Yusuf and wrote love dirges for him, the kind of love which we can’t contemplate; her love for him was unconditional and grand as the mountain itself. We stopped for a smoke and all of us spoke no word at that moment. With sombre thoughts of love gone mad in longing, clouds scattered around the vast sky – it was about to rain. What did we all think at that moment? How do we explain that feeling? The feeling of him being taken away from her, is this how love has to be? The longing has spanned centuries into present day Kashmir. Kashmir has always had such love stories. The stories without happy endings, where there are no silver linings at every storm. The quotient of happiness lies in how we perceive things, for Habba Khatoon she must have just wanted him to be on her side as I want to be amongst the mountains forever; lost and silent. By the time we reached the tourist reception centre in the middle of the town, it had started raining. Storytellers see things differently. The search for stories often leads the storyteller to unexpected places. We had driven eight hours non-stop to reach this place; it rained heavily as we arrived in the town but the tiredness of the journey stop me from staring at the mountain. It was getting late and we had to move ahead some 20 kilometres to find a camping site, so we drove onwards. The town of Dawar that we were in has small wood-logged huts with European styled rooftops, peopled by happy faced people with a smile on everyone’s lips. The excitement of driving ahead was reverberating in me. We arrived at this place called AP Bagh, it must have been an army camp before being destroyed; in the middle of nowhere there were barb-wires and base plinths for army quarters. On our first night we lit a big bon-fire with mutton and chicken barbeques for dinner. Late into the night we ate, spoke, warm tea in our hands. The experience was delicious. The first night passed on as we fell in deep slumber with the crackle of the burning wood. The next morning we woke up to light rain and a mix of sunshine, tea was being prepared with the smell of pine around. I took my cup of tea and sat in my tent scribbling down some words which were still resonating in my mind. Shortly after, we packed our tents back into our cars. We were ready to hit the road again. Through glaciers and broken bridges we reached Telail. Life is difficult here. We must embrace struggle, every living thing conforms to it. Everything in nature grows and struggles in its own way, establishing its own identity, insisting on it at all the cost, against all odds. People of in Telail speak Shina, a language of the Dardic people. When they spoke, I didn’t want anything else to hear. It was as sweet as the water of Neelum itself. Every turn we took and each person we saw looked at us with a smile and some surprise. I felt like an alien in my own land. These are my brothers and sisters and it just made me wonder how diverse our country was. Seven months of road closure separates Gurez from the rest of the valley. Gurez which is nestled in a galaxy of mountains and hamlets separated by broken bridges has just one hospital for 38000 people. The lack of a hospital is no extra-ordinary emergency for people here. They still linger on hope and their hope paves way for something extraordinary. A vegetable truck brings cheer and happiness around the faces of these resilient people of Gurez. “Aaj sab ke ghar mei murga banega” laughed the chicken vendor. The chicken had landed after seven months and it was a moment of celebration for people here. We bought few too and helped ourselves in cleaning and washing the chicken in freezing waters. My brother Shadaab - who has never done anything like this before got into cleaning and marinating the chicken for dinner. To reach the next camping site at Chakwaali, we had to cross a stream and marshy land; that brought smiles and excitement on my comrades’ faces. Something they could off-road now. All of a sudden the whole village came running and saw these men with machines doing what seems crazy to normal people. Water splashing all over and huge cheers came from the crowd. After crossing the stream, we all came to the camping site and posed for a group photo against the backdrop of half-hidden mountain under a blanket of white cloud with sun striking at its snow-capped peaks. Nature speaks to us in such a way that a man becomes completely numb. We were listening to U2’s Where the streets have no name. I was trying to figure out where we were. I tried Google maps on my cell phone but luckily it didn’t work. The place still remains a mystery to me and I can only connect to it with the U2 song. It was raining in the vale; the rays of sun piercing the clouds shone the peak in front of us. It was as if nature was trying to tell me how beautiful it is, like a new bride in her best gown; something that didn’t move but made me wonder. How small I am as I stood in that rain against the silver lining. 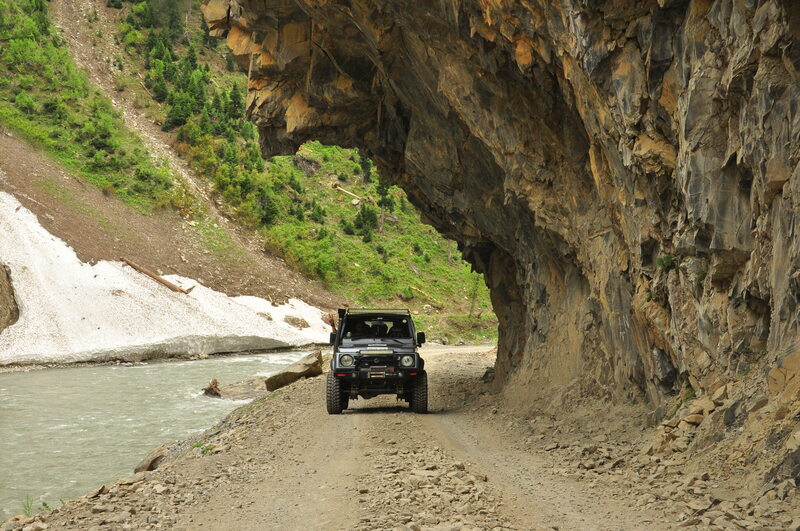 This feeling of being lost and to wander into unexplored lands of Kashmir is an unexplainable. A human being in this God’s backcountry feels like a speck. This is Gurez. We spent our night under the stars with mountain peaks shining like metal. In the middle of the night, I looked out from the window of my tent, it was cold and peaceful. The stars were bedecking the sky and everyone was delighted to be a part of this adventure trip. I slept at peace that night. I was under the luminous protection of stars and galaxies that night; my mind felt like it was the centre of the universe with everything moving around it. The music of cellos and there I stood in the middle witnessing it all happen; stars, the night, sound of the stream, burning fire and the feeling of being at peace. Personally I don’t like endings. There will be another journey and another story to write. We left in the morning leaving our souls behind in Gurez. We were touched and Gurez had become a part of us. “Imagine the whole picture without army bunkers, camps, checkpoints and artillery; it will be just like the way God created it”, I told this to Sajid and he couldn’t agree more. Gurez is unexplored and it should remain such. We, the non-conformists don’t want it to turn into a commercial mess. I left home to travel to Gurez and when we our comfort zones and we traverse into extreme wilderness – we encounter life’s abundance. 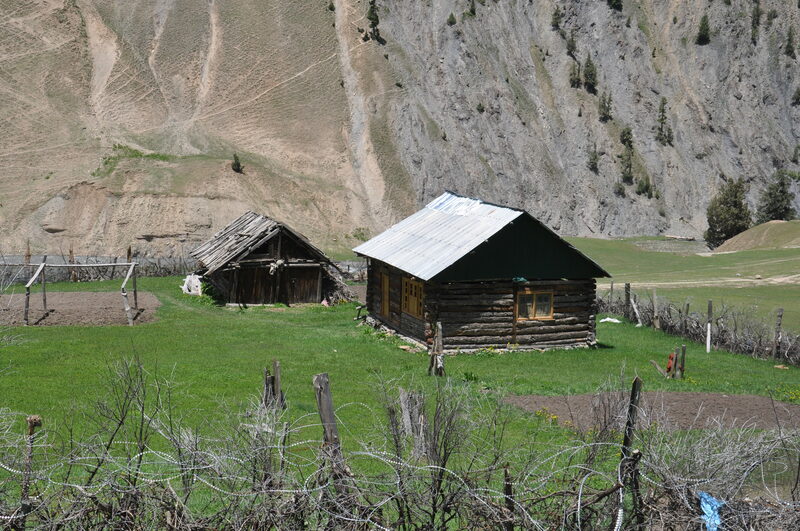 The people in Gurez are the most hospitable and loving. Hamlet after hamlet, smile after smile; it just took my heart away. A journey on the road, of the soul who wanders into the unknown. With or without you my love I always seek you through sunrise and sunset. Like a violin in the sky, clouds make it more musical than ever. For love she wrote; for nature I wander. Gurez, the mystical land. Omar Javaid Bazaz is a Ex-Flight Instructor from Texas, co- founder and owner of Ground Zero Grill & Cafe in Srinagar. He is an avid skier, mountaineer and an occasional writer.